2 WHY IS IT A PROBLEM? 4 HOW DO WE CONFIRM A DIAGNOSIS? 5 HOW DO WE RULE OTHER DIAGNOSES OUT? 7 HOW WELL DO THE PATIENTS DO? 8 WAS THERE A WAY TO PREVENT IT? 9 WHAT ELSE ARE WE WORRIED ABOUT? Wilson disease (hepatolenticular degeneration) is an autosomal recessive disease caused by mutations in the ATP7B gene. It is characterized by inadequate copper excretion within the body, and the failure of of copper to enter the circulation as ceruloplasmin (transport protein for copper). Copper normally is excreted by the liver into the bile using the copper transporting ATPase (ATP7B gene). Deficiency in these gene are what cause issues with copper excretion. 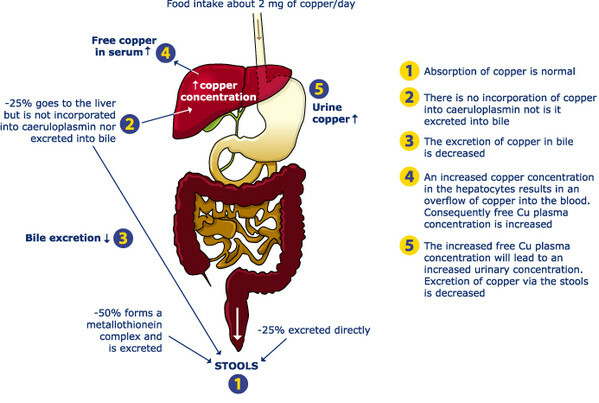 The inability to excrete copper will can lead to copper accumulation initially in the liver hepatocytes, which eventually causes it to spill into the serum. Eventually free copper can deposit into other tissues including the brain, cornea, kidneys, and joints which can lead to damage of these tissues. 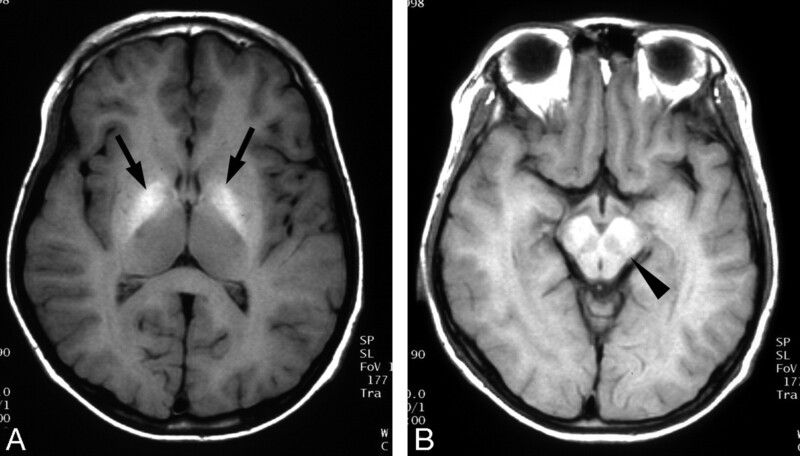 Parkinsonian symptoms can be observed due to basal ganglia degeneration. Hemolytic anemia can be caused by this condition (and patients might present with symptoms of anemia). Age of onset: patients often are younger/middle aged when they present with symptoms. 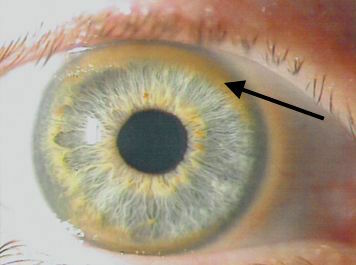 Corneal deposits (Kayser-Fleischer rings) these are golden brown corneal rings that are caused by copper deposition. Asterixis can be observed on physical exam. HOW DO WE CONFIRM A DIAGNOSIS? 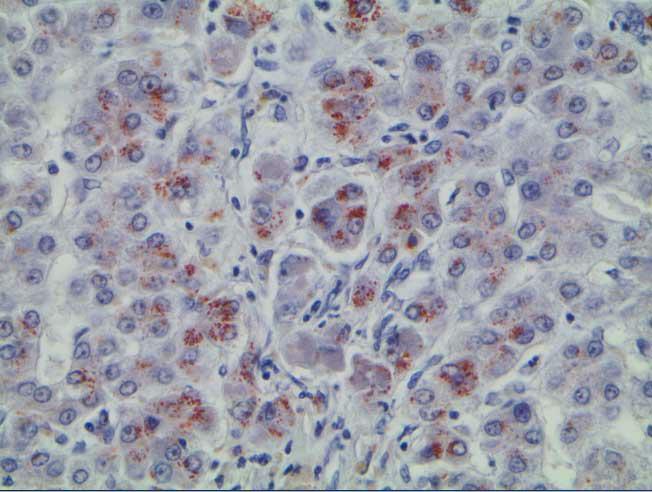 Liver biopsy will reveal increased copper deposition. Genetic screening for mutations in the ATP7B gene will ultimately confirm the diagnosis. HOW DO WE RULE OTHER DIAGNOSES OUT? Copper chelation using D-penicillamine or trientine. This process is fatal if not treated! The prognosis of the patient will depend heavily upon the extent of liver/tissue damage upon diagnosis. While this genetic mutation is not preventible, patients with a family history of the condition can have their serumceruloplasmin regularly screened. Neurological involvement (dementia, basal ganglia dysfunction, etc): brain imaging must be performed in most all patients with this disease in order to characterize extent of basal ganglia involvement (as well as other structures). Liver cirrhosis can be caused by the accumulation of copper within the liver. Fanconi syndrome can be caused by copper accumulation within the kidneys.